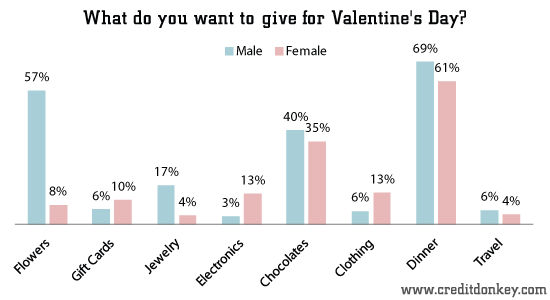 A new CreditDonkey survey reveals the differences in buying habits and expectations by the sexes this Valentine's Day. The survey found that men will be outlaying more cash. Men plan to spend 75% more than women, the survey of nearly 650 Americans found, with male respondents planning to spend an average of $84.39 and female respondents planning to spend an average of $48.13. Regardless of gender, 59% of Americans plan to spend at least the same this February holiday as they did last year, 23% plan to spend more, and only 18% plan to spend less. Are lovers on the same page this year? The CreditDonkey.com survey found a disconnect: Many partners don’t always want what they get. 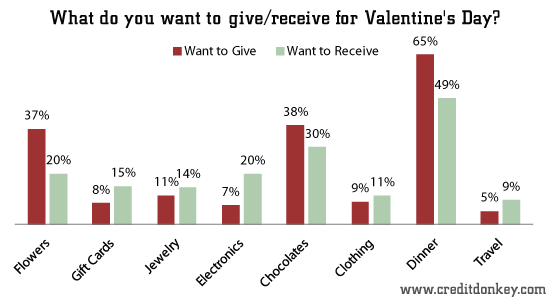 While most Americans plan to stick to traditions – 65% will take their significant other to dinner, 38% will give chocolates, and 37% will give flowers – our survey suggests it may be time to consider a less predictable Valentine’s Day gift. 15% of males plan to spend less this year, compared to nearly 23% of females who plan to spend less. More males plan to give flowers (57% of males compared to 8% of female respondents). More males plan to give jewelry (17% of males compared to 4% of female respondents). More females plan to give clothes (13% of females compared to 6% of male respondents). More females plan to give electronics (13% of females compared to 3% of male respondents). More females plan to give gift cards (10% of females compared to 6% of male respondents). Expressing one's love on Valentine's Day with candy, flowers and jewelry is a time-honored tradition. Leave a comment about Survey: Valentine's Day Statistics 2013? 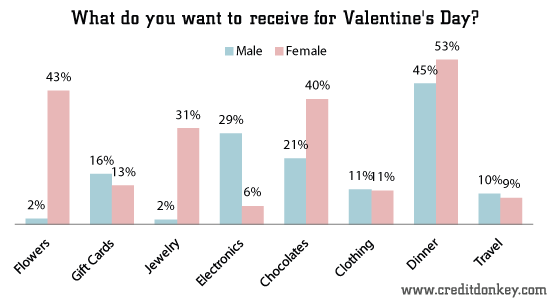 Share on Facebook "Survey: Valentine's Day Statistics 2013"